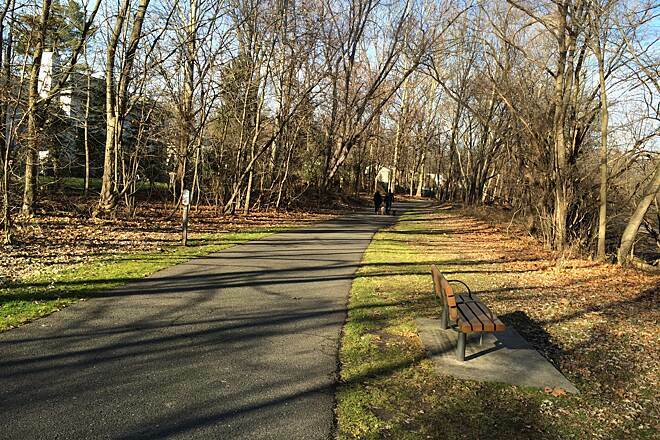 Bergen County's Saddle River County Park Bike Path traverses a 577-acre linear park system that hugs the banks of the Saddle River and its tributaries. 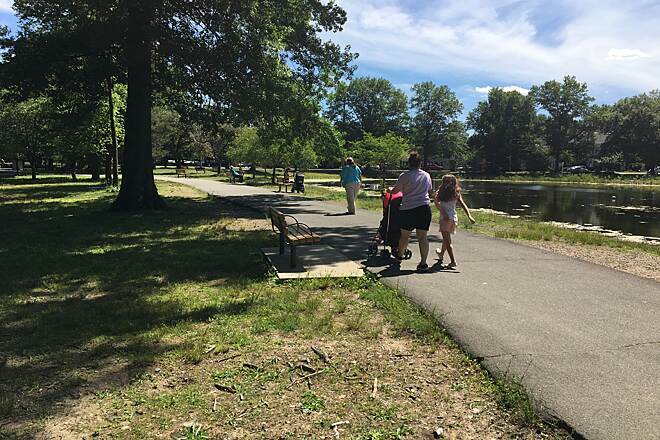 Five park areas are linked by the multi-use path, which travels from the Wild Duck Pond Area in Ridgewood south to Rochelle Park township. 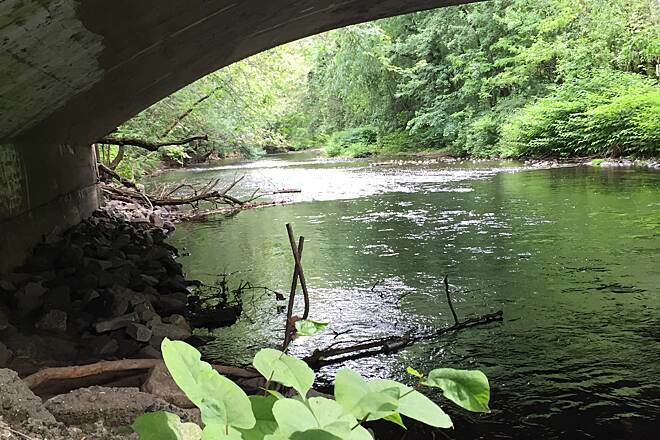 The path runs through Ridgewood, Glen Rock, Fair Lawn, Paramus, Saddle Brook and Rochelle Park along the Saddle River and Ho-Ho-Kus Brook. 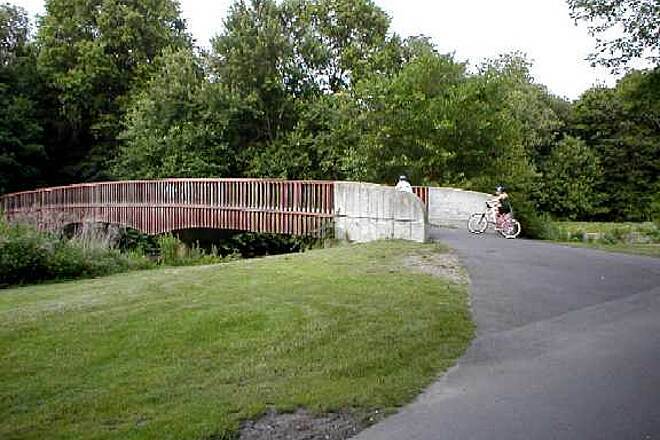 The trail experience includes ponds, shaded picnic areas, pavilions, playgrounds, tennis courts and athletic fields. 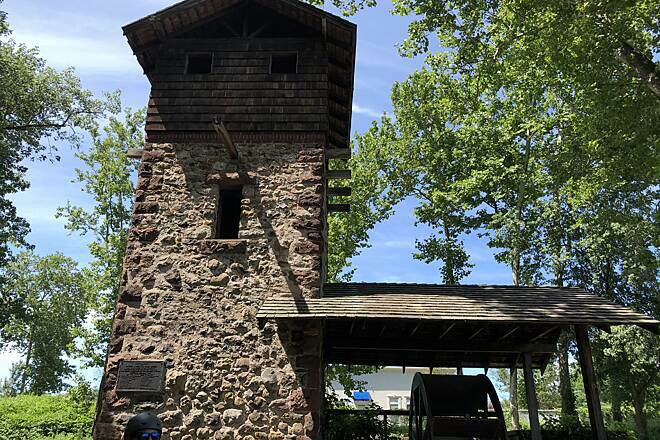 A highlight is its passage by the historical Easton Tower on Route 4. 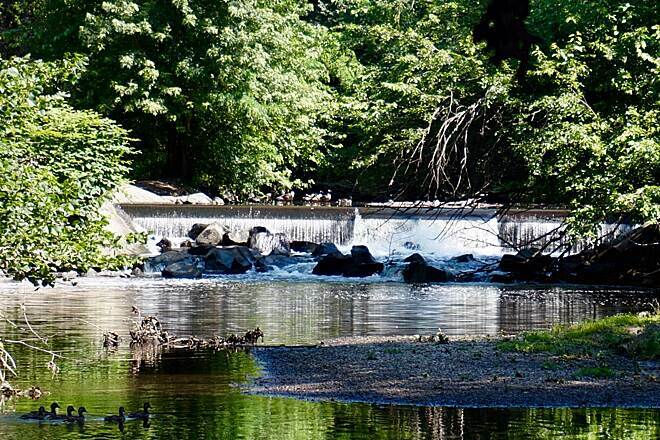 At Dunkerhook Park, you'll also find a waterfall. Speeding and unruly bikers come often. Many forgo the bikers' decorum of announcing their approach from behind. " On your left " or "On your right " should be the case, but that is actually the exception. Just be careful if you are walking. It is the only fly in this ointment. 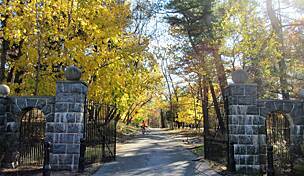 The section from Dunkerhook Road in Paramus to the northern end in Ridgewood pleases the sense much. I love to ride the bike path early mornings or late evenings. Walkers, etc please stay to the right of the path. Best bike path there is. Easy trail, fun. Not to be ridden fast. One of the best in NJ. Lots of walkers on this path make it to be great for those that are willing to be considerate bikers. Otherwise, its a great flat and easy trail. Be prepared to see lots of young children biking and joggers. I liked how the trail followed the river and the parking was great; it gave immediate access to the trail. My favorite part of the trip was the ice cream truck at the Ridgewood Duck Pond! Been riding this path for a few months now and I think it's great. It's best features are a flat, smooth path that's generally shaded and has plenty of sights, views and places to stop and rest. Open and well marked so you don't have to worry about getting lost. The park can get very busy during peak hours but weekday evenings are pretty quiet. If you're a cyclist, I'd suggest staying away from a weekend afternoon in the summer. The path has some nice off-road sections that mountain bikers can use. Nothing difficult at all so don't expect anything technical but there's still some fun to be had. As always, everyone should be aware of their surroundings and be courteous to others. I've never had a problem with other people but always yield to walkers/runners and anyone coming at me. Thankfully with the mountain bike I can jump off the pavement and avoid people in most sections. You can ride fast on this path as long as you're smart and slow down in congested areas. 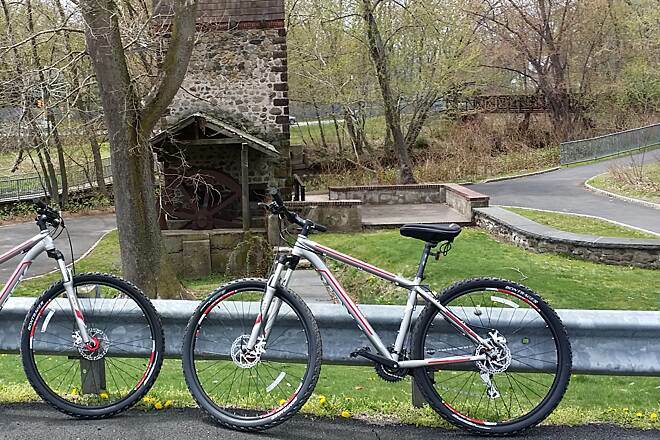 DH & I rode this trail today from the Railroad Avenue (Rochelle Park) parking lot to the Glen Rock Duck Pond. (Which was a little over ten miles RT.) We really enjoyed this trail. It is all asphalt and it is in great shape. 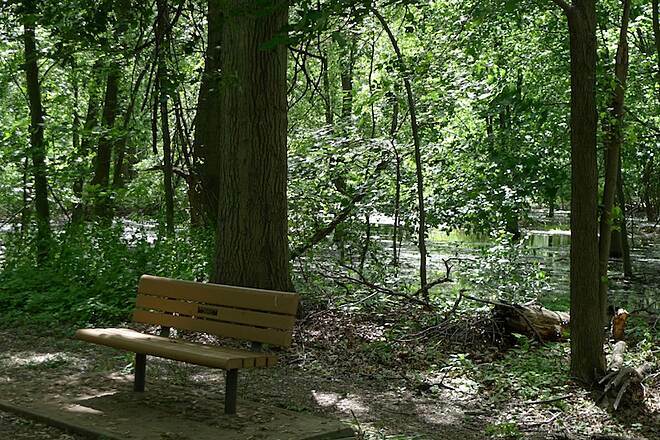 There are benches all along the route to stop and enjoy the scenery. There are several picnic areas as well. There are bathroom facilities and porta potties throughout the park. There are a lot of turn-offs, but they are all well marked, as well as mileage markers throughout. These paths are busy, but can be enjoyable if everyone tries to be considerate of others. We'll definitely be coming back to this one! 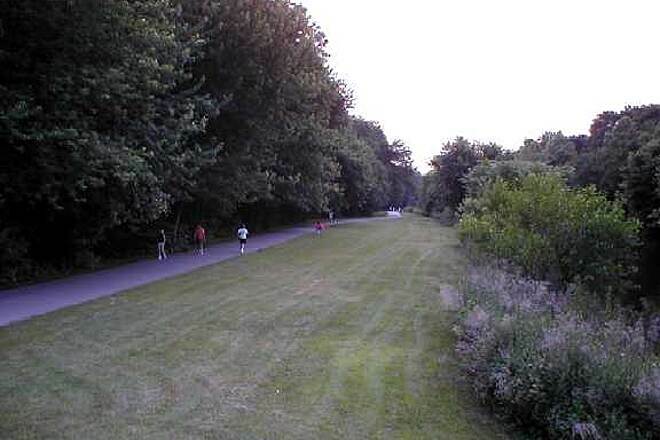 I Have been using this beautiful trail for over 20 years as a runner, walker and cyclist. In fairness, the majority of everyone using it, regardless of activity are considerate. However, in recent years there does appear to be an increase with reckless behavior that pose a real danger. I have seen many very young children on bikes, scooters, skate boards, etc. without helmets and in many cases just learning to ride. 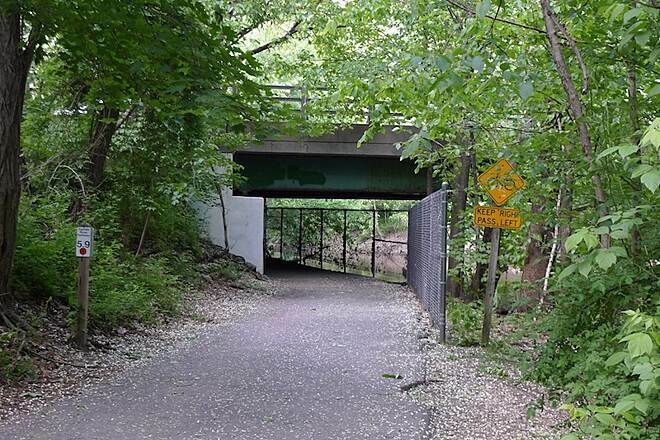 This path has a number of high risk areas with blind spots and steep inclines, especially the two route 4 underpass sections. 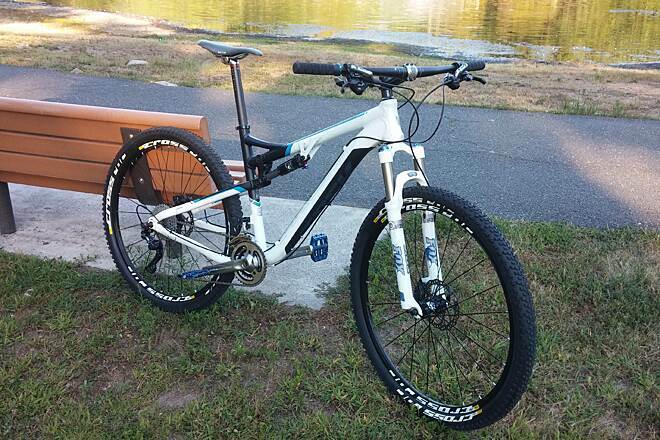 It is not for the inexperienced rider. 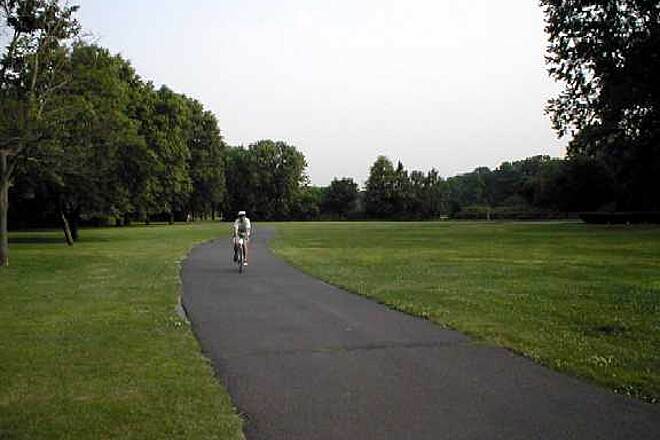 There are a number of park sections in Rochelle Park, Saddle Brook and other towns that offer much safer alternatives. 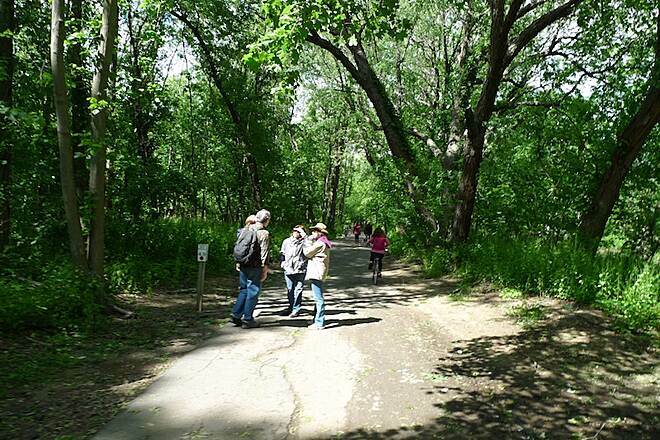 Other hazards include, dogs not leashed, leash too long, people stopped and having a conversation, and those who walk together across the width of the path. I believe many people just do not realize how much of a danger they are presenting to themselves and others. It's a real obstacle course when crowded. Cyclists who like a challenging fast workout should consider going elsewhere when crowded. They bear the ultimate responsibility, regardless of the poor behavior of others. Personally, not worth the risk. 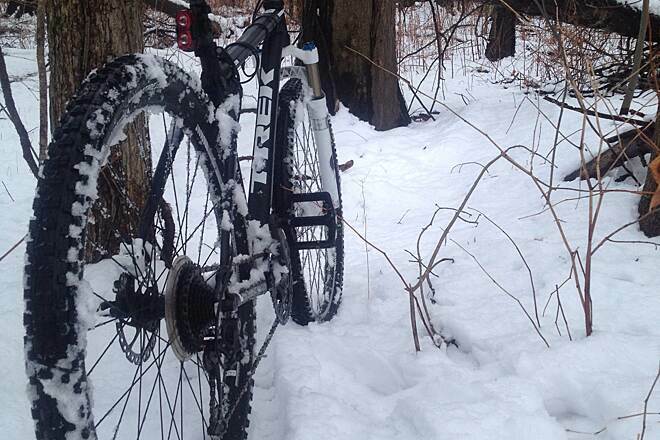 Try riding at off-peak days/hours, or just be resigned to the fact you must ride slow and enjoy the scenery. Unfortunately, the roads outside the park are not exactly bike friendly and hazardous in many areas with traffic and narrow roads. To assist in preventing any tragic events, the Park Commission should have rangers start patrolling and post signs that explain basic safety and courtesy rules. I've cycled this trail a few times this summer and I'm happy to say all the construction seems to be completed. 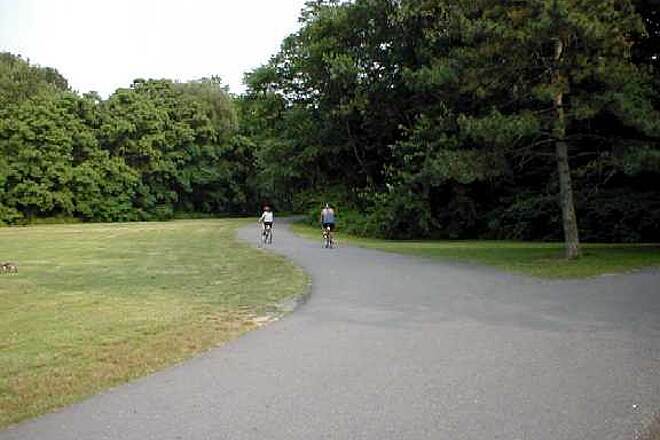 This is a popular trail so expect to share it with a lot of runners, walkers, in-line skaters and other cyclists. This is best used for casual cycling as it is too congested for fast riding. Except for busy weekends there is usually plenty of parking at the different parks that anchor the trail. I started riding this trail this past summer and really enjoyed it. There are plenty of different areas along the path that have parking. It can bet a bit congested with walkers, runners, in-line skaters and other cyclists - so be prepared to slow down in some areas. Try early morning mid-week if you want it more to yourself. 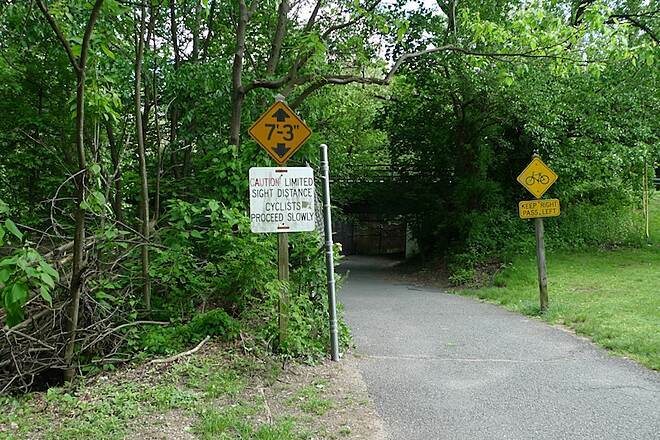 Parts of the trail were closed off at different points for construction in late summer 2014 and often did not have viable alternate routes or even any sign posted redirects to allow cyclists to get around the closed sections. Hopefully the entire trail will be open by this spring. Nice to have a safe paved path available so close to home. I walked the trail in my last trimester without any problems. I'm looking forward to working off the baby weight with a stroller. 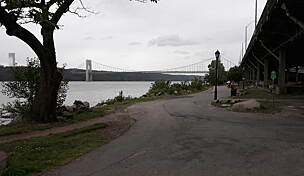 Albeit I do not understand why cyclist race up and down this short path when they can go under the GWB and get a real workout that's ideal for cyclist. This path is better suited for walkers joggers and inline skates. Plenty of benches and clean restrooms. Playgrounds not overly crowded. I have ridden the trails in this park twice and have enjoyed it both times. My only complaint are the walkers who think it's perfectly fine to walk with 3 to 4 people across the lane--learn to share. The trail is is very dangerous. Cyclists in full gear speed up and down the trail as if there in a race. They scream at people walking with children. 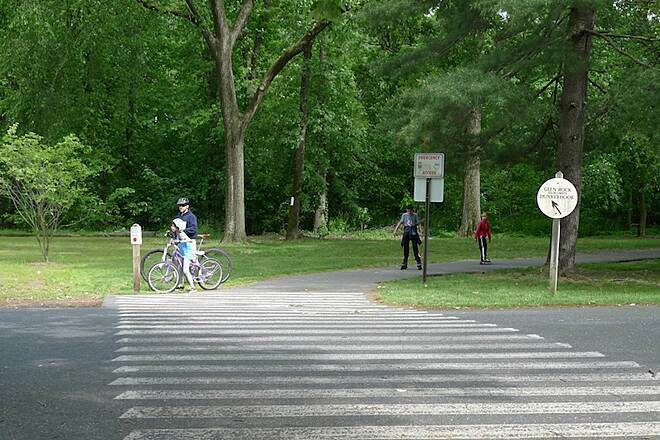 There should be a speed limit on the trail that protects pedestrians. Its the easiest trail to bike ever. Old ladies and toddlers can walk it. Yet these posers act like they are crossing the alps. I have recently discovered this trail/path and love it. 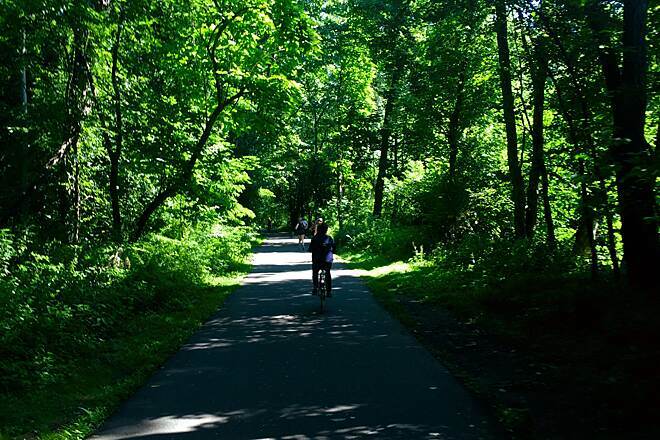 I ride a bike for exercise and to enjoy the quiet of the trail. It's shady with some open meadows and is very scenic, with no major hills. It's well-used, which is nice for safety, but makes courtesy very important. Cyclists should go slowly and carefully in the few narrow or blind spots, as well as announcing or ringing a bell when passing anyone from behind. Walkers and joggers should stay to the right (not the left - treat it like you would a road in your car) and try to take up only half the trail. Walking spread out or three abreast makes it hard for cyclists to get by courteously. Be especially careful if you are wearing headphones - this makes it harder for you to hear anyone approaching from behind. 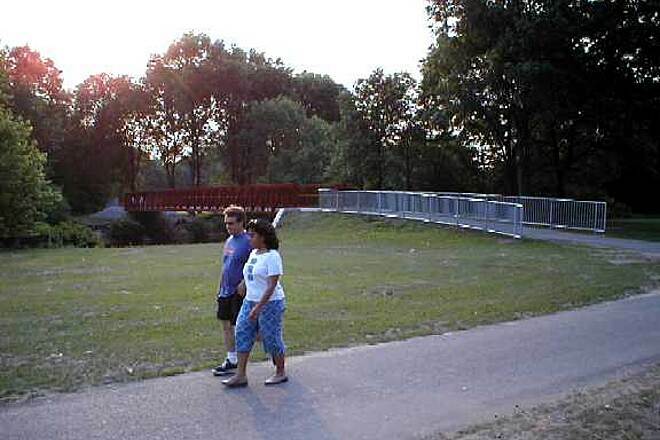 For a mixed-use trail, I find most people very kind and courteous, which makes it more enjoyable for everyone. Bike Rules must be enforced! My dear friend and I walk in the mornings for exercise. We've had close encounters with cyclists that come from behind us, at high speeds and fail to give proper notification (not that we would be able to move out of the way, at the speed they sometimes travel). I think cyclist should be fined for traveling at excessive speeds. I personally witnessed a near accident when a cyclist came speeding down the turn on one of the bridges and another cyclist traveling in the opposite direction, was almost hit. We would have been hit too had the two cyclist collided. I'm not saying all cyclist speed, but those that do, are putting us in harms way! Last year a middle aged man on a bike said some nasty disturbing things to me I was very upset but no phone on path and no security in park. I called Paramus police to report but they do not secure park the told me to contact Bergen County Police secure so I called them to report incident. If you are a female be very careful ..carry cell phone ..I have been going to this park over 15 years and just don't feel comfortable any more I think this is a magnet for degenerate perverts. With the exception of my experience today this trail is one of my favorites for a leisurely family outing. Well paved and shaded path with many scenic and pleasurable stops along the way. However, a half mile in from the Ridgewood parking lot the trail was closed due to construction. If there were detour signs I sure had missed them and the detour route itself. I finally got frustrated and snuck around the barriers blocking the construction area. I wasn't the only one either. But other than that the remainder of the trail was just as nice as ever. I'm a walker, not a biker. If you walk this trail be prepared to be approached by bikers traveling at up to 50 feet per second who think they are in a Tour de France time trial and who consider you to be a spectator viewing their glorious ride. I was nearly hit by two bikers today. Truly mayhem on the path. What were the trail designers thinking? We rode this trail on a Wednesday afternoon and found it to be full of people riding, walking and roller blading. We're leisure riders, so we didn't have a problem with anybody really blocking our way. Everyone was considerate of each other so we had a pleasant ride. The trail is really smooth, clean, and well maintained with plenty of shade. Lots of parks along the way and benches galore. A really great ride. Look forward to riding this gem again. I prefer to bike this trail off hours. Narrow trails are busy with many riders and hard to get a rhythm going. But very scenic path along the creek and around the pond. Near pond parking lot, Well cleaned bathrooms bring this to a 4 star for me. There is also a ice cream truck on the weekend with beverages (including coffee). Not far from the Garden State Plaza mall. 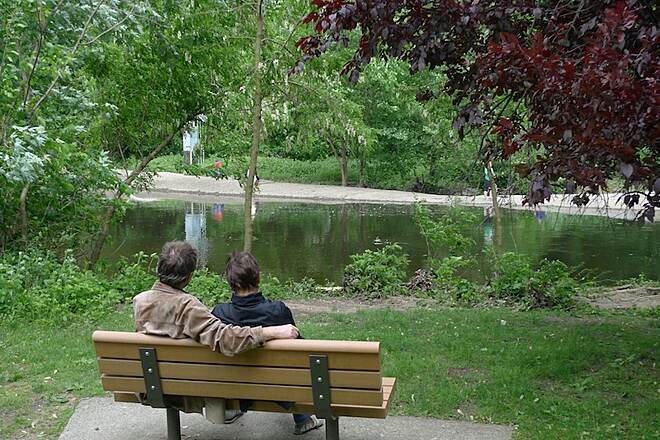 My wife and I will make a day of this park followed by some shopping and dinner at the mall. I've been cycling and running here, year-round, for 25 years, and never get tired of it. End to end from Rochelle Park to Ridgewood it's 6 miles, and one can tack on a bit with a detour to Glen Rock Pond. Well maintained, it is re-paved on a regular basis. I've run it one day after major snow storms, so they waste no time plowing it. From Rochelle Park, just one minor driveway crossing at mile 1.4, and a perimeter road around a parking lot at 3.7-4.1 (albeit minimal, very slow moving traffic here). So this is a great family-friendly path. If you like to cycle, you do need to get here in the morning before the crowds pick up, but it's almost never THAT crowded to detract from this great path. Met my wife on this trail 20 years ago, what is not to love! My wife and I did this path for the first time today. A little chilly in some of the shaded areas - we just went about 2 miles up before turning around - I will definitely be back all summer long. Paused to watch a beaver swimming and fishing for river oysters. Great for families with big play areas every mile or so. Loved the Tower and Water Wheel. 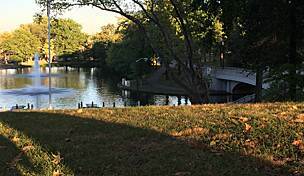 Reminded me a bit of biking the C&O canal in DC area with the historic buildings right near modern communities. It's a great bike trail. Not too crowded during weekdays but on weekends it becomes an obstacle course. Have to get on the trail early on weekends to avoid crowds. On weekends, some people tend to walk three or four across taking up the entire width of the path. If you want an easy trail.. This is the one for you. This trail is mostly flat paved trail that winds through various towns. 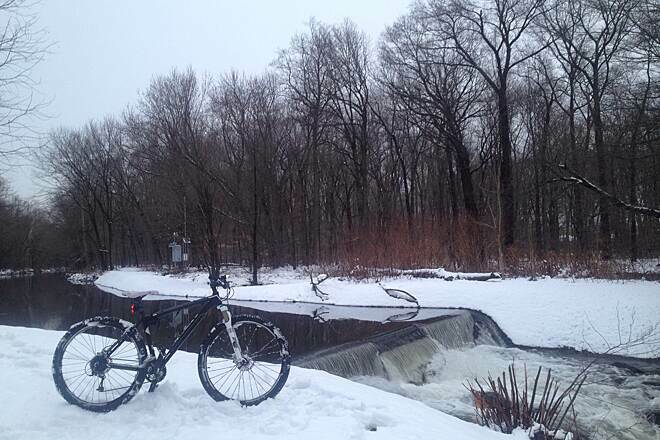 A good portion of the ride borders a brook and there are places to take a break right next to the water. 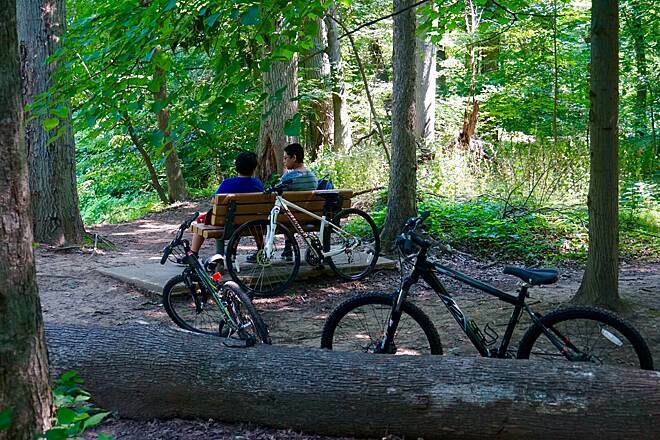 You will share the trail with joggers, walkers and bikers. 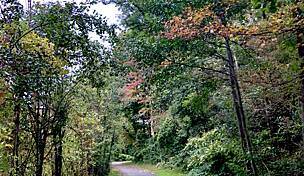 Although the trail winds through neighborhoods and houses, the dense foliage lets you forget you are in the midst of civilization. This has become my "after work" trail since it is easily accesible from major highways in North Eastern NJ. 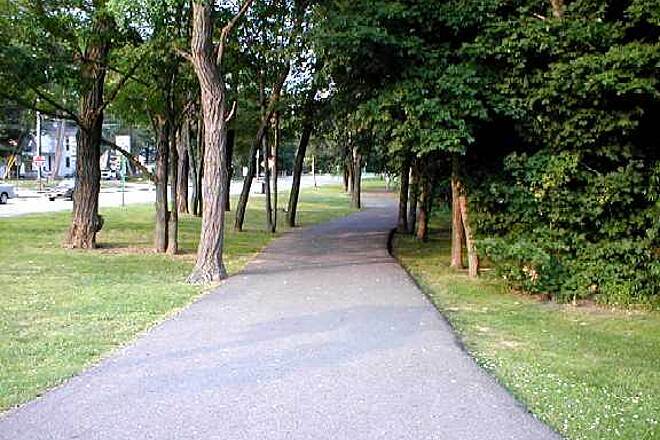 Great pathway....you can run or bike along with your kids and encourage them to the next playground for a break. The path is mostly flat but has a few slight inclines. There are many benches along the route, another great place to take a rest. I took this from the north end to the south and back again. This was such a beautiful ride. I would suggest starting at the south end and progressing to the north, where the ride gets more scenic as you go. Enough to see on the way to keep it interesting. Just watch out for those who don't understand the concept of "keep right." 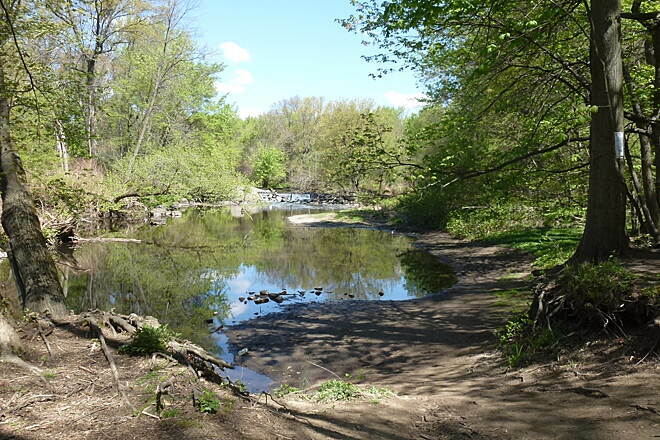 We had substantial flooding here due to thunderstorms one Thursday in June, (Much of the path is adjacent to the saddle River) and yet the all the affected areas had been completely cleared of silt and sand within two days. 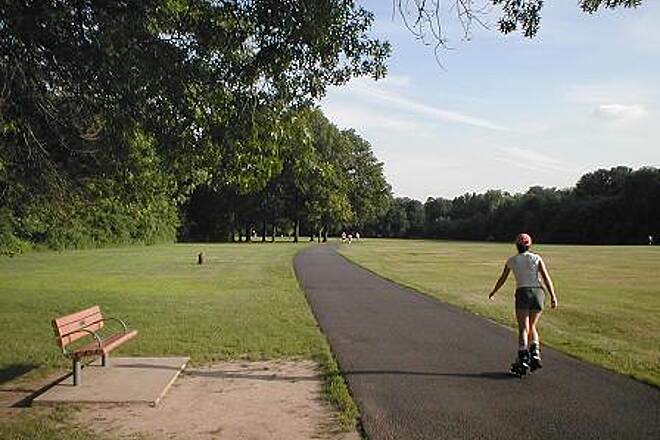 Multiple places to park and multi-use areas such as playgrounds and ball fields along the path make it a winner as well. The path crosses no roads, except for the parking lot in Ridgewood. You don't have to worry about cars. There are a few split offs to go to a few towns parking lots. The trail is 6 miles each way. 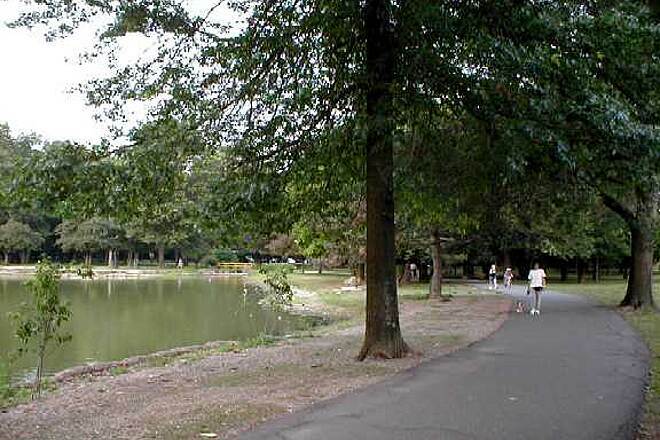 That's from the Ridgewood Duckpond to Paramus road/route 4. This is the main route and every 10th of a mile they have mile posts. If it rains heavily the day before Ridgewood leg gets dirty because it's right next to the river,all the other parts are fine. They have plenty of benches if you need to rest,but the trail has no lighting. I would like to take my daughter for a bike ride and do the whole path. Although I can view the map just fine and can see the general route, sometimes it's not quite so clear from the ground. Can anyone let me know if the trail is clearly marked? Particular when it crosses car roads or turns off in another direction? Thanks! I've been running this trail for at least 5 years now during training for marathons. If you go from end to end (Ridgewood to Saddle Brook), as well as do the Glenn Rock cutout...the whole loop is about 14 miles long. When it snows, the path is usually cleared the next day and very well kept. Definitely recommend this to anyone in the area! Many different entrances you can start from. Best place in Bergen County! 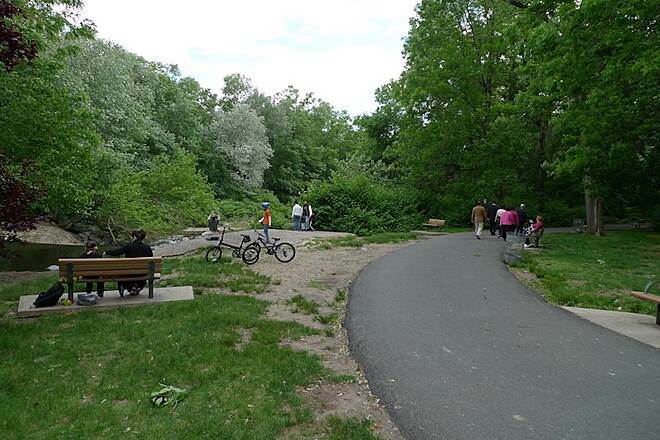 I watched this path being built in the wooded area that I explored as a kid behind my house. That was in the mid-'70s. At first it was a dirt path. As time went on they paved it. No one really knew about it and I was one of the very few who used it. Little by little it got longer and longer. I knew it was only a matter of time until my well kept secret would be discovered. 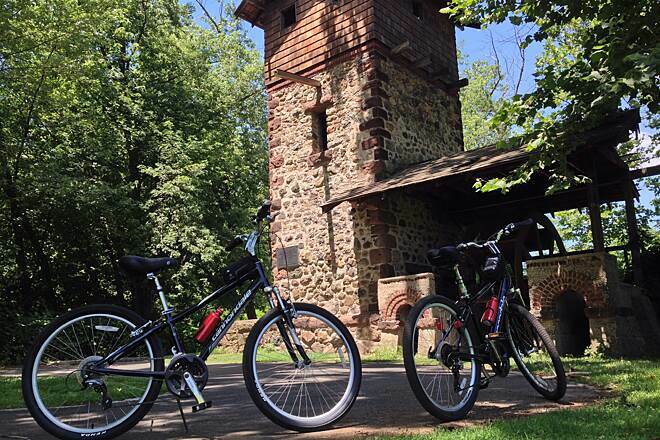 Now, it's one of Bergen County's nicest accomplishments. Yes, it's crowded on the weekends, but I've learned to share (or wait 'til Monday). It's very clean and full of wildlife. Orioles, rabbits, geese and mallards are plentiful as are all the wonderful dogs that people walk. 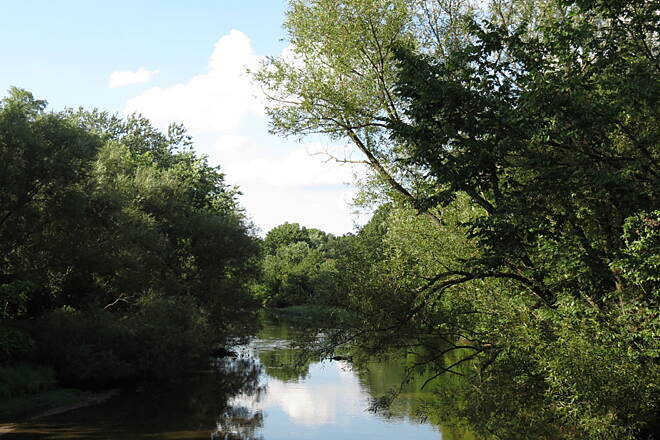 There are people fishing along the banks and in the water. A very peaceful and beautiful place to get some exercise. It's great when the ducks have their little babies and you see the duck families walking along the side of the path, close to the water. 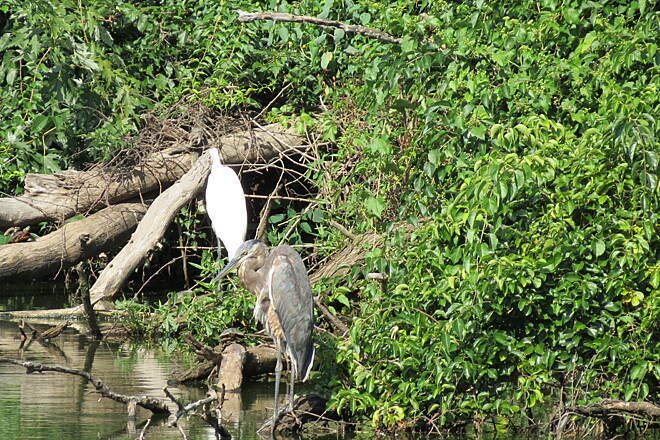 I treasure this place and hope others will continue to respect its wildlife and cleanliness. 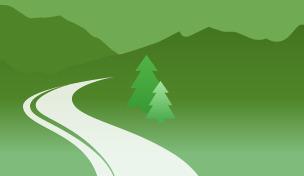 With this trail you'll never actually cross a road you are away from motor vehicular traffic. 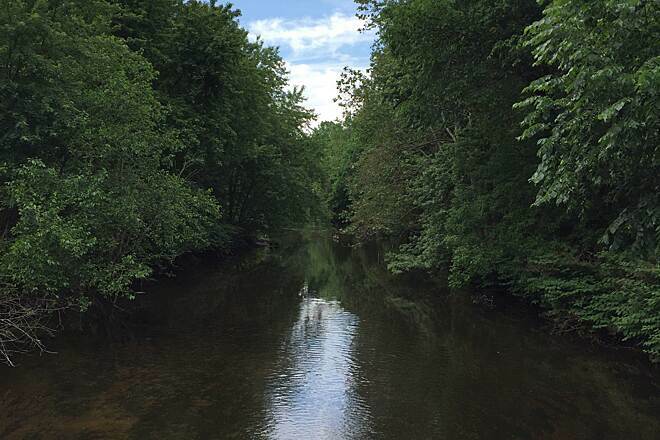 Running along side the Saddle River in the middle of nature so close to NY this trail is a must for joggers, bicyclists, inline skaters, or just those who want to explore a little relaxation and get back to nature in the middle of the busy Paramus area. Great bicycle path but get out there early on a weekend! I am so grateful for this beautiful bicycle path which is within easy riding distance of my home. Over the winter I was walking/running on this path and it was perfect; not too crowded and very well maintained. But I knew I couldn't continue to walk my 8 miles when the temperatures started to climb. So I tuned up my bicycle and I was out riding at 7:30 am Saturday morning. It was wonderful; cool and not too crowded. The people I did see were friendly but focused. I felt like I'd been given a free membership to a gym. I went out an hour later on Sunday morning. Big mistake. Generally speaking, it's definitely a more leisurely crowd after 9 o'clock, with less consideration for 'the other guy'. I encountered several groups of 3 walking side-by-side chatting, monopolizing the path, oblivious of who was coming up from behind. Even when I would politely say 'on your left' they grudgingly moved over just enough for me to get by. When there was oncoming traffic, I had to stop behind them, in order to avoid a collision. So to all of you people who are serious about your workout, take my advice and get out there early. It's beautiful and stress-free! 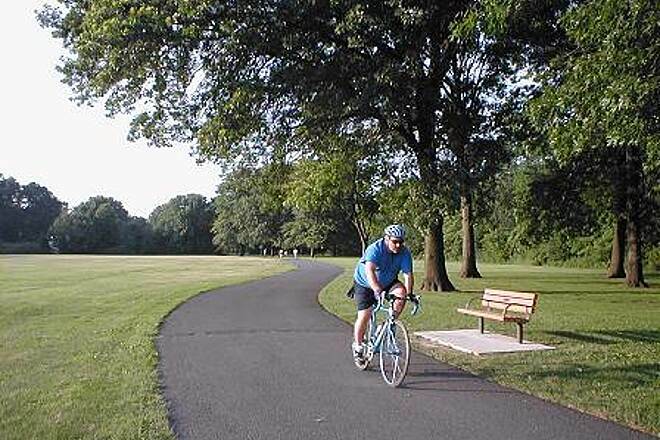 "It was a pleasure biking the full length of this path from Rochelle Park's Railroad Avenue to Ridgewood's duck pond and back. 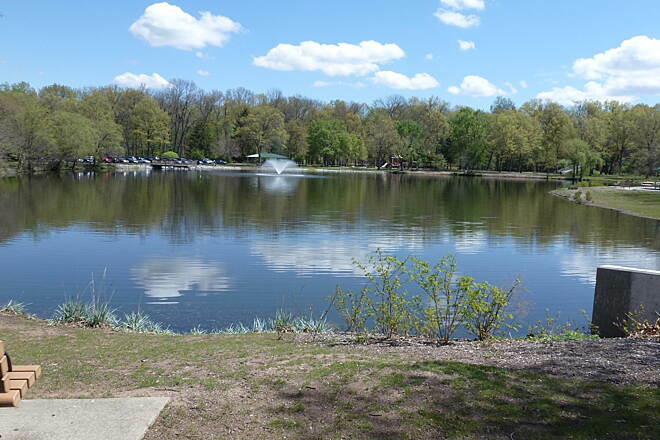 My odometer read 15.8 miles including some meandering around the ponds of Glen Rock and Ridgewood. The path is very well marked for directions and mileage. 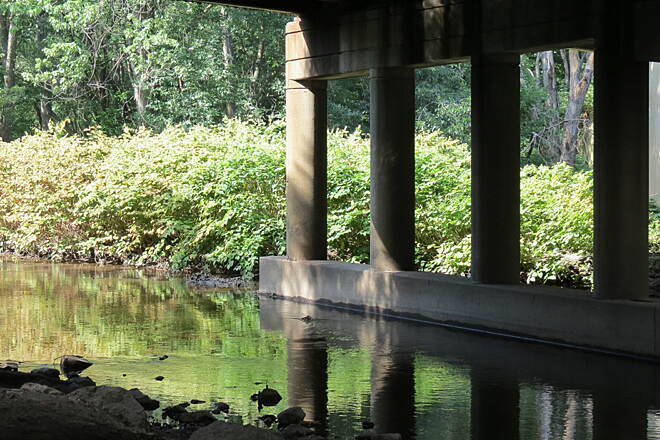 There are several bridges to cross including a wooden platform snaking under Route 4. There are adequate cautionary signs for head clearances and narrow passages, but nothing to be worried about. There are many hikers along the route, and so be mindful that you are just sharing this path with them. The path goes through open spaces and narrow spaces, all of them visually pleasing. There are plenty of places to stop and rest, or ruminate if you wish. 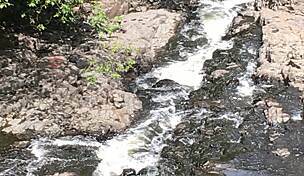 The Saddle River is often in sight, and there is a point where it turns into a small waterfall. 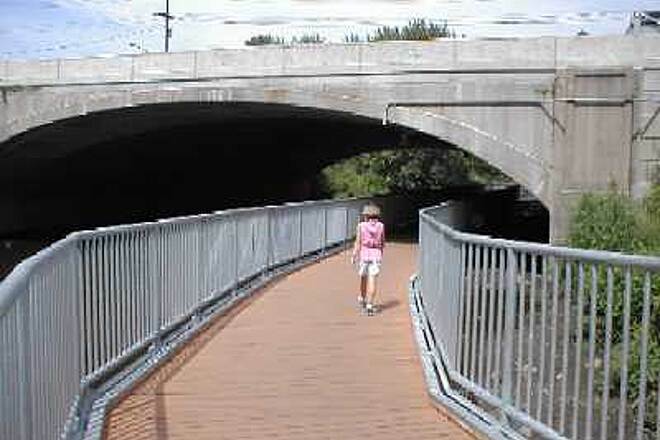 The path provides straight-aways and easy uphill climbs over the bridges. There is one somewhat steep hill to contend with but shifting gears takes a way the work. All in all, it's a great bike path, and you should check this one out if you are into biking or hiking. " 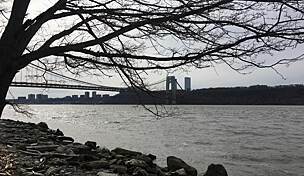 "This trail is completely paved extending 18 miles and connects Ridgewood, Glen Rock, Fair Lawn and Saddle Brook. 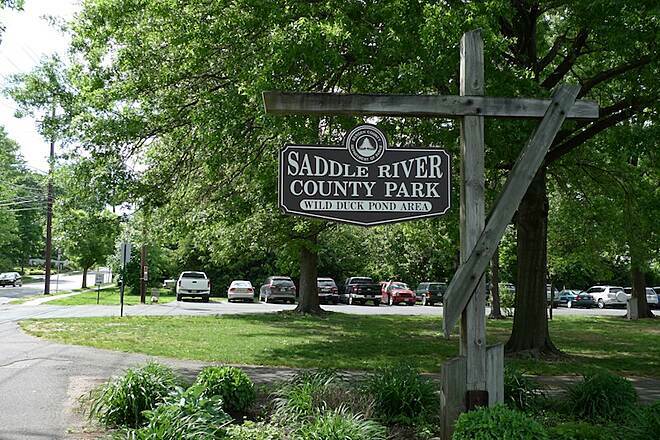 It is excellent for training for marathons or bike racing (earlier in the mornings before the path gets busy) and has several restroom facilities along the trail as well as public water fountains. 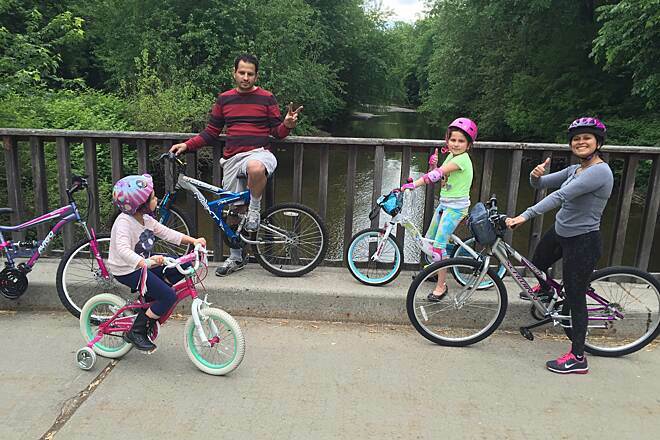 The path does not cross over public roads (there are overpasses), so it is perfect for young children on bikes." South from Ridgewood Duck Pond: lovely! Here the trail is right next to the river. The pavement is in great condition and the shoulders are in good shape for runners who want to spare their knees. 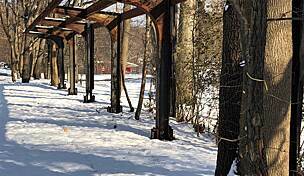 Cold weather trail for hikers!
" I review this trail as a hiker. I am sure this is a wonderful trail for bikers, skaters, joggers, dog walkers, baby strollers, etc, but for hikers it is too heavily used. 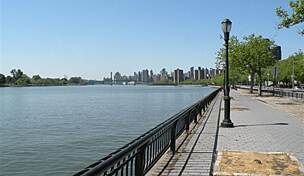 It does pass through a busy suburban area with few street crossings, and the river, bridges, and adjoining parks are pleasant for casual walking or combining with park or picnic activities. It is well paved, wide, and well-maintained. There is plentiful parking at most road crossings, and access from parallel roads. 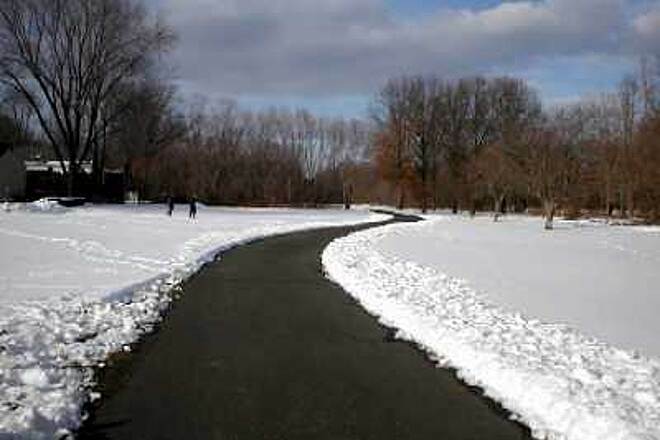 As a hiker, I find this path most useful in the winter, when the cold and/or snow keeps the other users to a minimum. 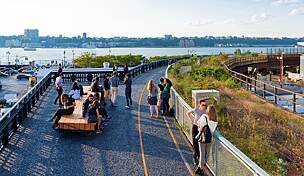 I do not mind sharing, but in warm, sunny weather, I feel too crowded on this popular path. 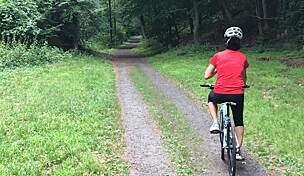 "The best multi-use trail in New Jersey is about to get better. 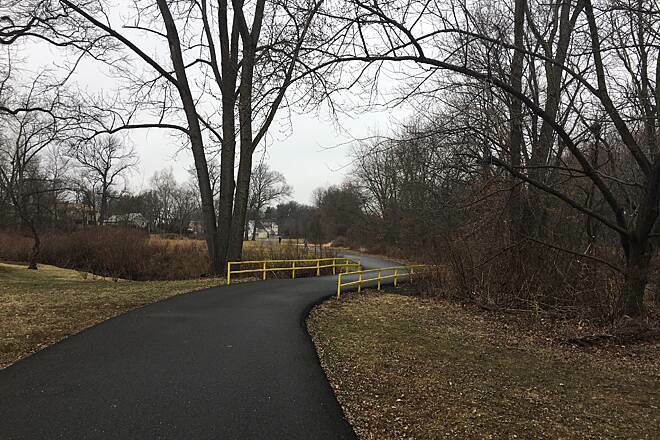 With the completion of highway improvements at the SR4/208 interchange, the Saddle River bike path will be joined with the Rochelle Park/Saddle Brook path, creating a continuous corridor from Ridgewood to Rochelle Park (about 8 miles one way). 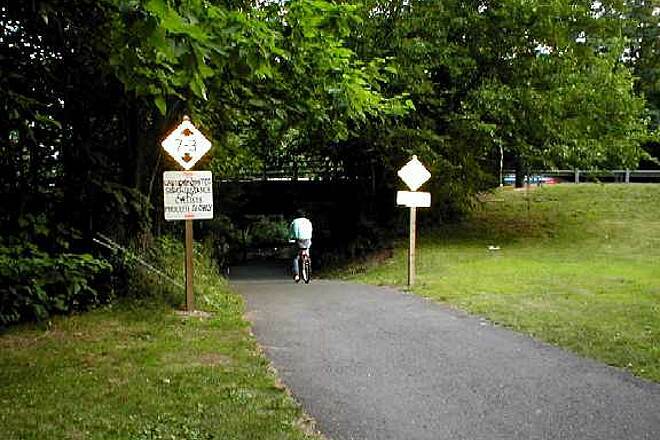 This multi-use trail gets a lot of use. My favorite activity on this trail is running. The project is expected to be completed by the end of 2001 or early 2002." 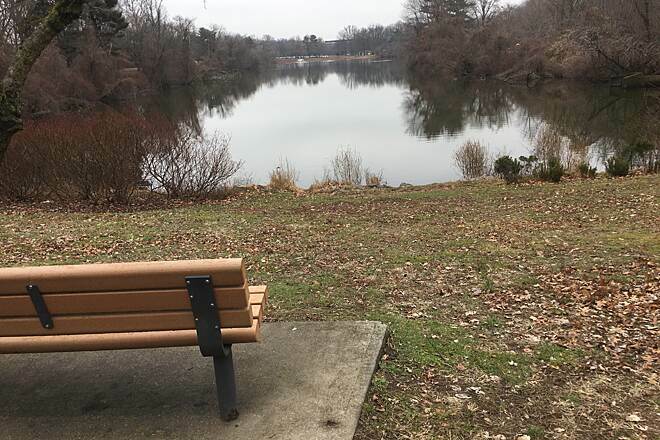 "Already a fine linear park, the northern section will soon cross under Route 4 and connect to the Saddle Brook section of the county park system adding another 6 miles. (a three mile long figure 8 which goes to Railroad Ave in Rochelle Park.) With the exception of some really rough spots of short duration, most of this trail is paved well-enough for skating, my first love. There are also many spurs which go off into the woods that dirt bikers enjoy. If you haven't been there, it's worth the trip to check it out." 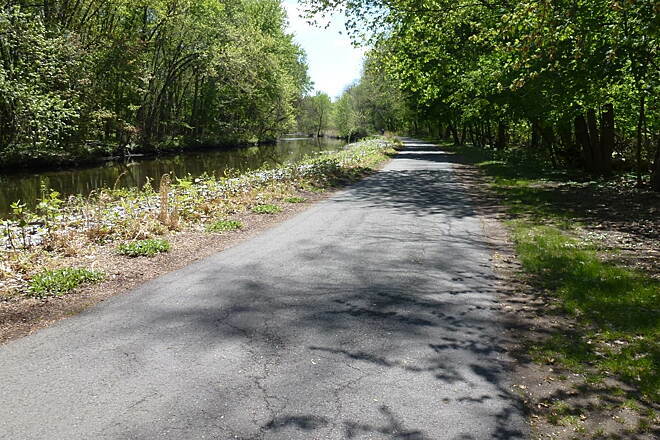 This is the premier paved bike trail in Northern NJ. 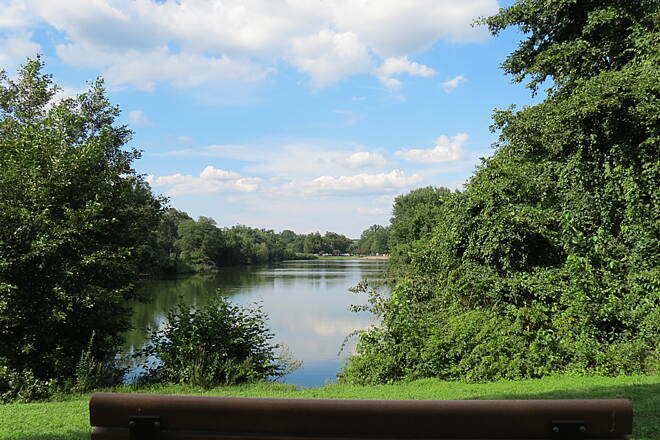 No street crossings and wonderful views from the banks of the Saddle River and Ho-Ho-Kus brooks. Plenty of free parking at the connected Bergen County Parks Department facilities. E-mail if in area for further details.